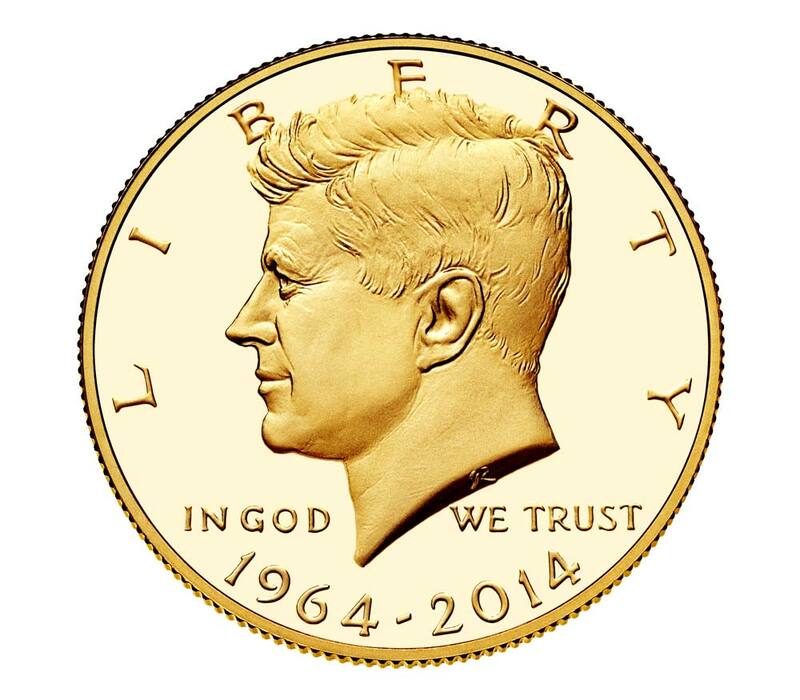 The 2014 50th Anniversary Kennedy Half Dollar Gold Proof Coin is the first gold half dollar offered by the U.S. Mint. Each coin contains 3/4 troy ounce of pure, 24–karat gold and is struck with a proof finish at the U.S. Mint at West Point, New York. The raised Kennedy profile is frosted and appears to float on the mirror–like background. 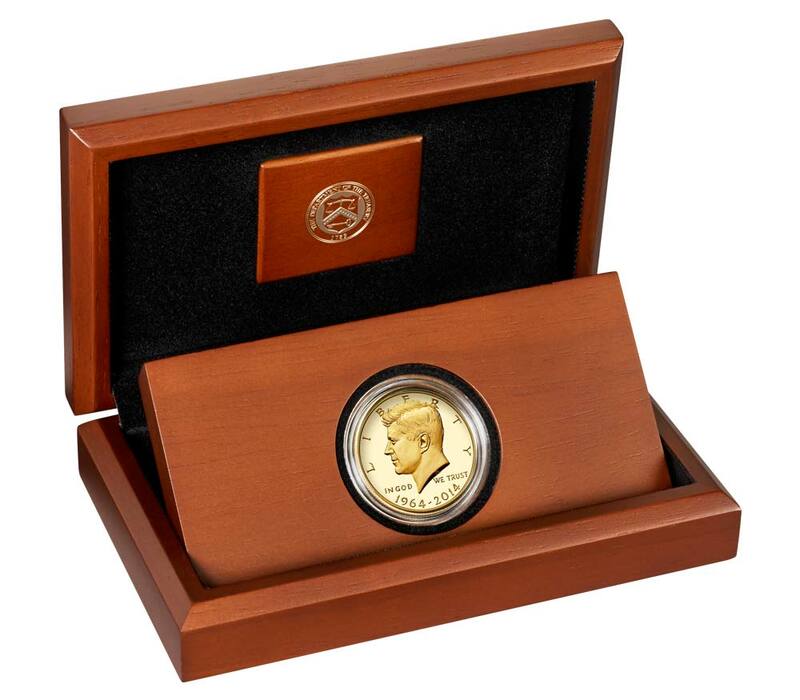 The coins are encapsulated and packaged in a single custom–designed, brown mahogany hardwood presentation case with removable coin well and are accompanied by a Certificate of Authenticity. Obverse: A portrait of John Fitzgerald Kennedy, the youngest–ever–elected president. U.S. Mint Chief Engraver Gilroy Roberts based this profile on a portrait prepared for Kennedy’s presidential medal. 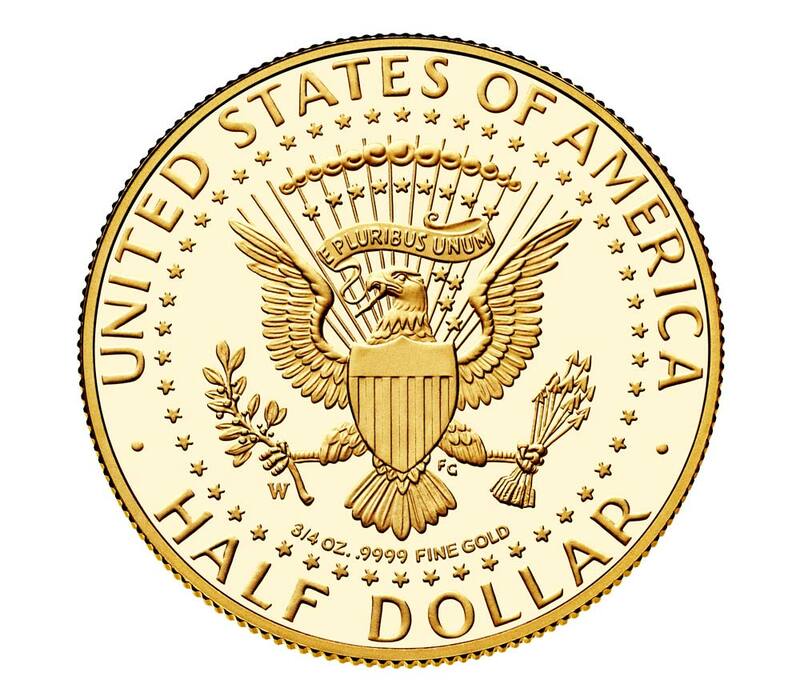 Reverse: Based on the Presidential Seal and was created by U.S. Mint Sculptor–Engraver Frank Gasparro. It consists of a heraldic eagle with a shield on its breast holding a symbolic olive branch and bundle of 13 arrows. It features the inscriptions “UNITED STATES OF AMERICA, HALF DOLLAR” and “ 3/4 OZ. .9999 FINE GOLD.” A ring of 50 stars surrounds the design, which gives this coin the distinction of having more stars than any other U.S. coin ever produced for circulation. 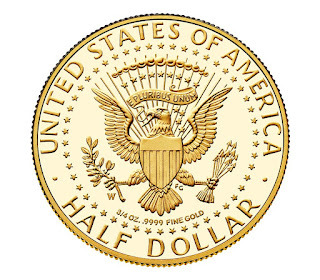 First Gold Half Dollar Offered by the U.S. Mint. 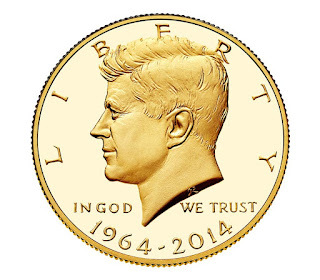 Features the original 1964 Kennedy Half Dollar Obverse Design. Three–Quarter Ounce of Pure, 24–Karat Gold. Diameter: 1.205 inches (30.61 mm).